The rugged, all-steel Cyclo® BBB4 is designed for reliability, efficiency, and longer life. 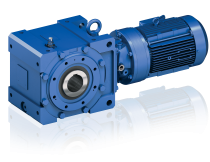 The Cyclo® or planetary inputs deliver greater performance with less wear than conventional gear designs, and the series delivers increased power ratings, higher torque, and a wider selection of shaft diameters. Also available are 46 new standard ratios and 87 optional ratios. Unified Lubrication System: Single oil-bath lubrication system for easy maintenance and higher performance. Compact Design: The most torque-dense right angle gearbox design available in the industry. The new ductile iron housing allows for higher radial load in a small, compact design. For more information, see our feature on the special features from Sumitomo or contact us at AutomatedPT.